Diabetic retinopathy is a serious complication of diabetes and a major cause of blindness in the United States. It occurs when the tiny blood vessels in the back part of the eye, also known as the retina, are damaged by high levels of sugar in the blood. These damaged blood vessels then leak blood and fluid into the retina. We often tell patients that the retina is like a sponge. When the sponge is dry, it works well and allows us to have good vision. When the sponge is wet (from blood vessels leaking fluid into the retina) we lose our best vision. We call this macular edema when the leakage occurs in the center of the retina, or macula. This is the part of the retina needed for such activities as reading and driving. Not only can these tiny blood vessels leak into the retina, but if they become so damaged that they can no longer deliver blood (and oxygen), the retina begins to suffocate. This is known as retinal ischemia. 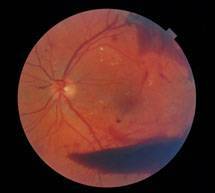 New, abnormal blood vessels then grow to try to help bring blood and oxygen to the retina. We refer to the presence of these new vessels as proliferative retinopathy. These abnormal vessels can bleed into the center of the eye causing a vitreous hemorrhage. These blood vessels can also cause the formation of scar tissue. This scar tissue sometimes pulls on the retina which can dislodge the retina from its natural position. This is called a tractional retinal detachment. Macular edema, retinal ischemia, vitreous hemorrhages, and retinal detachments can all lead to decreased vision and even blindness. The diagnosis of diabetic retinopathy is made when your doctor performs an eye exam and dilates your eyes to look at the retina of each eye. If the retina shows evidence of damage from diabetes, your doctor may refer you for additional testing to obtain a fluorescein angiogram. This is a test in which dye is injected into a vein in your arm. The dye circulates in the blood stream and can be seen, with a special camera, circulating in the blood vessels of the retina. We can tell by the pattern or dye circulation in the retina whether any blood vessels are damaged, and even if new abnormal blood vessels exist on the retina. This helps us decide if treatment is necessary. The treatment of diabetic retinopathy starts with good control of blood sugar, blood pressure, and blood cholesterol levels. If macular edema is present, we may recommend focal laser treatment. This causes the damaged blood vessels to stop leaking fluid into the retina. If the initial laser treatment does not work, we may suggest either a second laser treatment, or an injection of steroids below or into the affected eye. Steroid injections have also been shown to dry up the macular edema. If proliferative retinopathy is present, and meets certain criteria as described in previous studies, we will recommend scatter laser treatment to the retina. This has been shown to cause the abnormal vessels to regress. This significantly decreases the chances of these blood vessels bleeding into the vitreous and/or causing a retinal detachment. If the proliferative retinopathy is very advanced, scatter laser alone may not be sufficient to protect the eye. In these cases, we may suggest a vitrectomy to remove the blood-filled vitreous and, if present, the scar tissue from the retinal surface. Research studies looking into new treatments for diabetic retinopathy are currently being done at many academic centers around the country. One such study suggests that through the administration of specific drugs, we will limit the retina’s ability to send signals to the body to grow new, abnormal blood vessels. This could help prevent proliferative diabetic retinopathy. None of these drugs have yet been approved for general use on patients with diabetic retinopathy. It is important to understand that not all diabetic retinopathy will respond to treatment; however, retinopathy identified and treated early will usually do better. For this reason, we strongly recommend at least yearly, a dilated eye exam with one of our doctors at Vision Care Consultants. If you have any questions regarding diabetic retinopathy, please come into our office to discuss your eye health.